Playing a threat just because it is sente, and for no other reason, is a typical novice mistake. When it comes to ko fights, this becomes a more difficult discussion. Ko threats that are loss-making have a special name in Asian languages; to become a ko expert one has to pay great attention to the idea. You do need ko threats in a ko fight. Playing loss-making threats is clumsy, and assumes that the ko fight is all that matters. That need not be the case. Weaker players often play loss-making ko threats until the points lost outweigh the value of winning the ko. 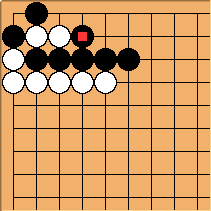 Here is a (free) audio go lesson by Guo Juan on loss-making threats. Should Black prefer a, b or c here? We assume Black is looking for a ko threat in this part of the board. Usually playing c is the worst idea. 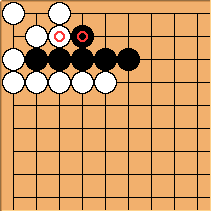 After , Black's stone looks like abject failure (mochikomi). Black can probably make further threats here such as d, but after White e Black has lost some further points. From the point of view of avoiding possible loss, Black's best choice is this threat. When White answers at , looks like a kikashi, that is, has some positive effect in addition simply to being sente. Of course has aspects of aji keshi - just about any ko threat does (see the aji machine). It isn't clear without more information whether is a loss. After Black has the play at d, and one should know before coming to a judgement whether White could play e or f. If White can play f and capture everything that would constitute a big loss for Black, but the fight might be big enough to distract attention from the ko. 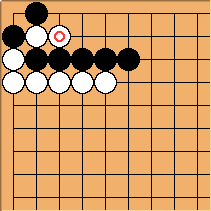 White might play at e, in which case Black will probably be satisfied. Summary: Threats that come in deeper risk loss; threats from outside risk little. Some examples of a local ko threat that may make a loss. 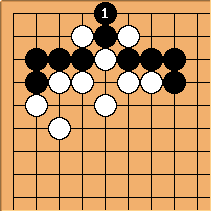 Suppose White plays as a threat during the ko fight in the corner. If Black answers it at , and White later wins the fight, it is a bit disappointing for White to have made this exchange. 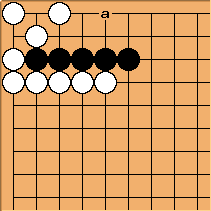 That is, in this position the exchange / looks better for Black. Here White should want to jump - at least as far as a. If Black wins the ko, White will regret the exchange of for , since it loses 2/3 point, on average, by comparison with the position when Black wins the ko without that exchange. Therefore, even though White has a local ko threat, she should play it only if it is crucial; for instance, if it is necessary to win the ko or if it forces Black to make a losing ko threat of his own. While type 1 of loss making threats are always bad, the other types can be played according to the expected outcome of the ko.